30 mg per tablespoon or 10% of the USDA recommended daily allowance. last few years, many margarine producers have reformulated their products. I Can’t Believe It’s Not Butter, for example, now (in 2006) bears a notice on its label proclaiming “NO TRANS FAT,” and the amount of polyunsaturated and monounsaturated fat per serving has dropped from 4.5g each to 4g (polyunsaturated) and 2g (monounsaturated) per serving. foods. Some of the “Butter vs. margarine” mailings circulated in 2005 had this preface tacked onto them: Margarine was originally manufactured to fatten turkeys. fat in the original recipe had been replaced by vegetable oils. the yellow margarine that has come to be the norm. I received this from my friend, a retired executive chef, Lonny Ritter, now living in Thailand. Margarine was originally manufactured to fatten turkeys. When it killed the turkeys, the people who had put all the money into the research wanted a payback so they put their heads together to figure out what to do with this product to get their money back. It was a white substance with no food appeal so they added the yellow coloring and sold it to people to use in place of butter. How do you like it? They have come out with some clever new flavorings.. Butter is slightly higher in saturated fats at8 grams compared to 5 grams. Butter tastes much better than margarine and it can enhance the flavors of other foods.. Butter has been around for centuries wheremargarine has been around for less than 100 years . Share This With Your Friends…..(If you want to ‘butter them up’)! ‘When someone shares something of value with you and you benefit from it, you have a moral obligation to share it with others. Pressure cookers for homemakers have been around since 1917 when the USDA announced that the only safe way to can low-acid foods was with a pressure cooker. 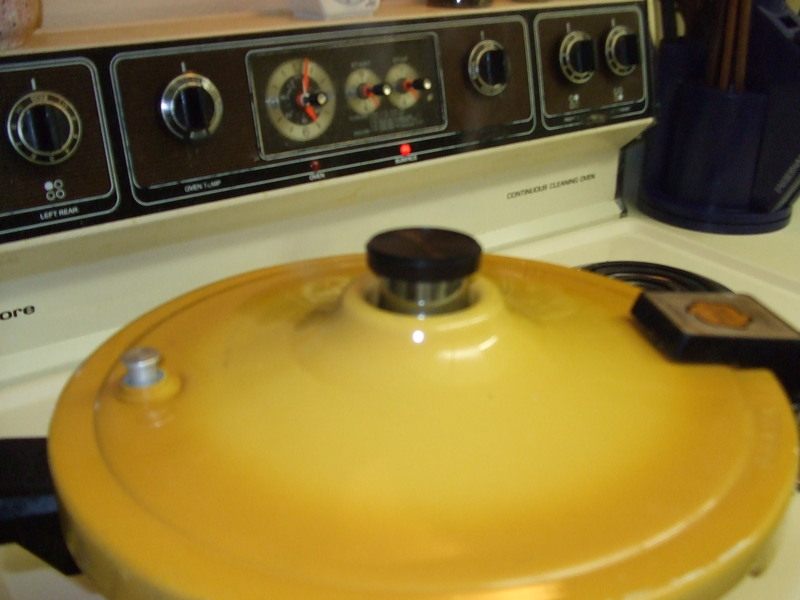 From then on the National Pressure Cooker company, now called Presto, has engineered and redesigned pressure cookers with reliable safety features for home use. So long as the rubber gasket around the inside rim of the lid is in good shape and you haven’t lost the regulator (jiggler) or damaged the pressure valve, you can save time when cooking dried beans, roasts and other long cooking dishes. A pressure cooker is absolutely mandatory if you home-can veggies, meat or fish. They come in 4 quart and 6 quart sizes and up to the 10 gallon size for canning quarts. You can find them in most housewares departments and even at garage sales. 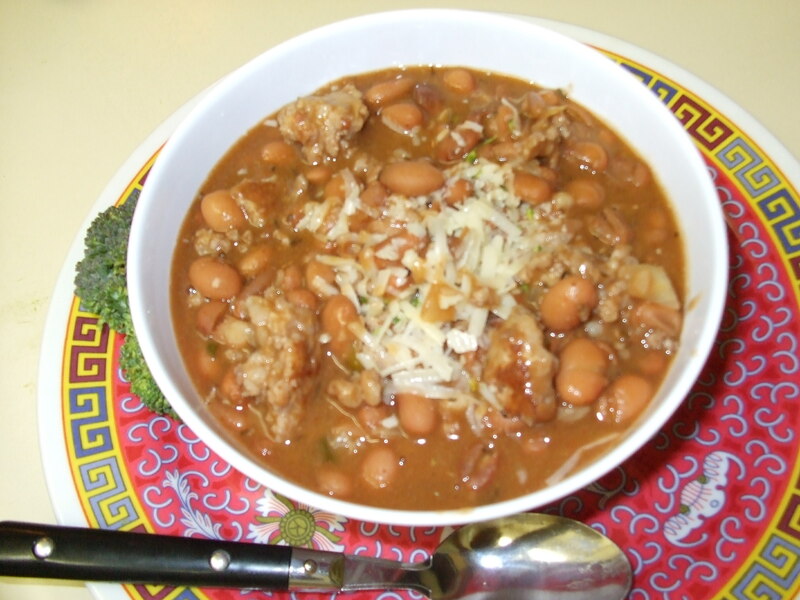 Try this method for chili, corned beef, pulled pork, or octopus. Flavors have no where to escape, they’re locked in using a pressure cooker. For more information on cooking with a pressure cooker, see Presto. 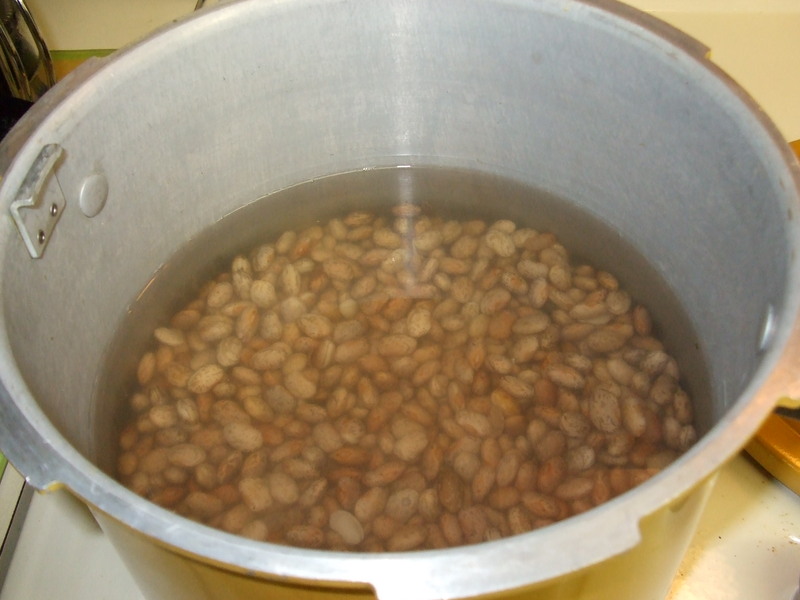 Soak beans overnight in 2 quarts water. Drain and cover with fresh water. Saute ground pork in skillet over medium high heat. 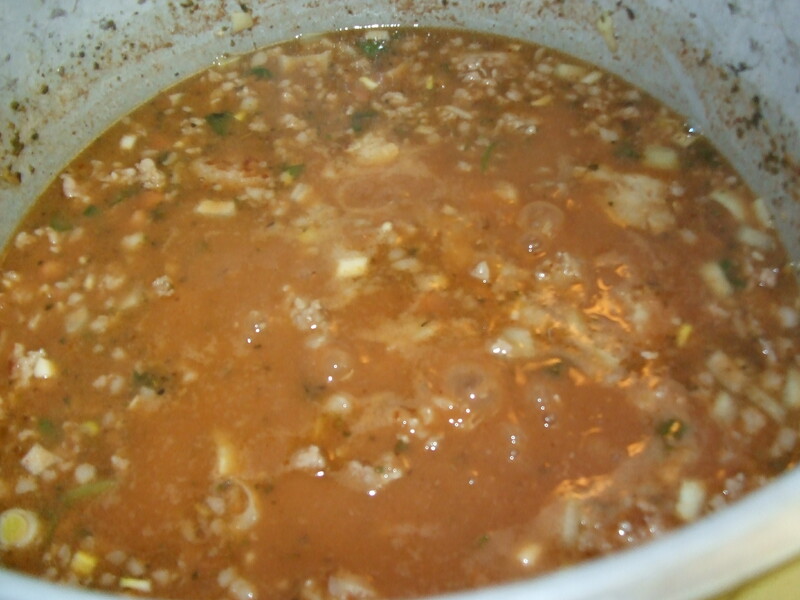 Add remaining ingredients, cook for 3-4 minutes, and transfer to pressure cooker. 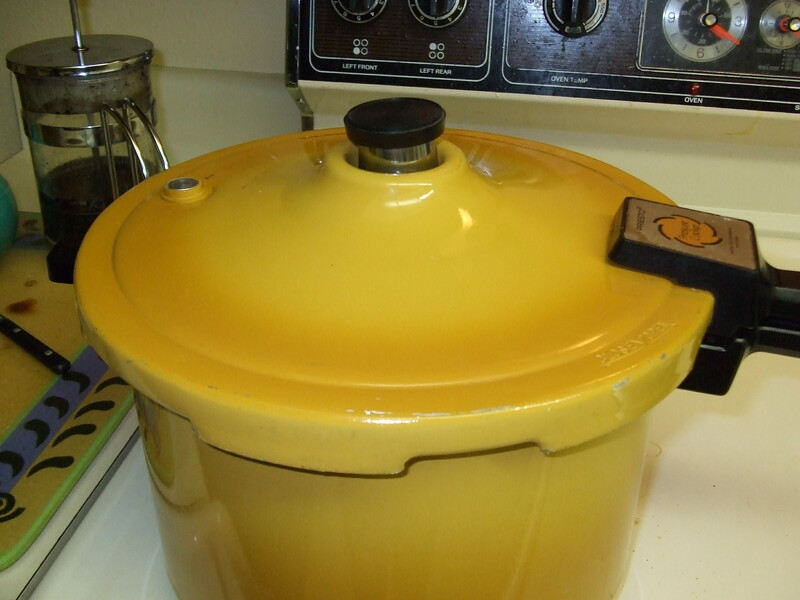 Cover pressure cooker, locking lid into place and set jiggler over steam vent. Once valve stem pops up and jiggler begins to rock, set timer for 40 minutes. When timer goes off, turn off stove and leave pot to cool down. When valve stem drops, it is safe to remove jiggler. If no steam is escaping from vent, open lid. Easter is just around the corner so you can start practicing the art of boiling eggs right now. For years the media hype on the ill-effects of eggs put off the daily consumption of eggs. The fact is, eggs are very healthly. The secret is to buy farm-fresh eggs that have not been refrigerated and are not more than 7 days old. A farm-fresh egg has lutein for your eyes, choline for your brain, B12 for your nervous system and are a cheap source of protein for building strong bones and rejuvenating cells. Eggs have also been proven to help lower bad cholesterol levels rather than exacerbate bad cholesterol levels. If your local health food store or farmers market doesn’t carry farm-fresh eggs, ask them to do so. Cover raw eggs with cold water. Bring to a boil over high heat and cook for 5 to 7 minutes uncovered. (Use a timer if you are busy.) Turn off the heat, cover the pan and let sit for 5 to 7 minutes. Then drain off the hot water and run cold water over the eggs until they are just barely warm. 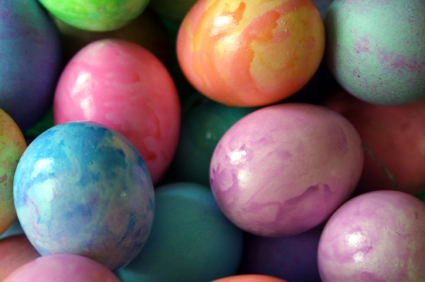 At this point, eggs may be colored for Easter baskets or an Easter Egg Hunt. To shell eggs for your favorite dishes, crack the eggs all over while holding them under the cold water. The shells should come off in a ribbon and the yolks will be lovely and yellow. To make your own colors simply use a separate ramekin or tea cup for each color and add 1 tsp white vinegar and 1/2 cup boiling water to each cup. Then add as many drops of food coloring as needed to make the desired colors. When I lived in the South Pacific, only brown eggs were available and dyed Easter Egg was not a cultural tradition in the islands. But, a lot of ex-pats got together and celebrated Easter with an Easter Egg Hunt, easter baskets and egg exchange. Obviously, brown eggs would not color so we used felt pens and drew geometric designs, crosses, flowers and such on our brown eggs. Some of them were quite artistic. At any rate, we were still able to celebrate our Easter tradition a long ways from home. Eggs symbolize the rites of spring or new beginnings. The celebration of spring was actually a pagan festival prior to Christianity. The Christians adopted the pagan holidays for church holidays hoping to eradicate the pagan rituals. However, small elements of those ancient pagan rituals have continued to exist in most of our holiday celebrations today. 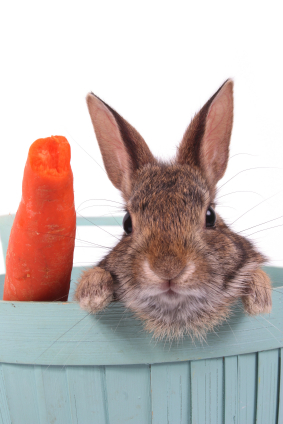 So we can thank the pagans for their contribution to civilization and the pagan part of our Easter traditions. How many ways can you use hardboiled eggs? Let’s see! Drop a comment and tell me what I’ve missed! Deviled eggs: add a pinch of curry and sweet pickle relish with the mayo and mustard. Egg-salad sandwich: add tuna or chicken, pineapple bits, arugula and/or fresh basil along with a slice of tomato or mango chutney. Salads: add chopped eggs to a Caesar salad, or wilted spinach salad, add sliced eggs to a Cobb salad, egg wedges to a Chef’s salad or Salad Nicoise. Creamed eggs: on toast with parsley garnish for breakfast, or with ham on biscuits for lunch or a quick supper. Pickled eggs: Boil 1 cup water with 2 cups cider vinegar, add 1 Tbsp of pickling spice. Let cool and pour over shelled eggs in a sterile jar. Refrigerate for a few days. To add color to your proverbial “boneless chicken” place pickled eggs in a jar of pickled beets. They’ll change color within a day.